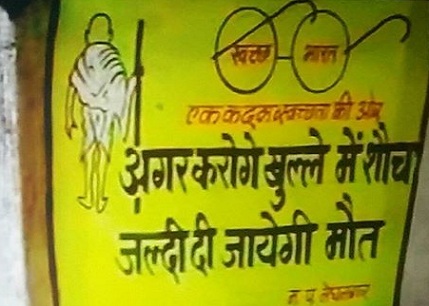 BHOPAL: The Swachh Bharat campaign seems to have gone a bit too far in Madhya Pradesh where objectionable messages ranging from obscene words to threats are being used to deter people from open defecation. The latest is the case in Jhabua district in Eastern part of the State where the message ‘Agar karoge khule mein shauch/Jaldi di jayegi maut’ (If you go for open defecation, you will be killed soon) was painted on the walls. One such message painted near a temple angered local residents. Local leaders staged protest against the ‘threatening and violent tone inherent in the message’. Citizens approached the authorities and threatened a stir. The municipal officials initially said that it was not intended to harm anyone but the aim was to create awareness. “We are looking into it, how the mistake was made. The message is being corrected”, said Pramod Toshniwal, chief municipal officer of the Meghnagar municipality. Recently, in other parts of the state obscene messages targeting ‘bhabhis and chachi’ defecating in public’, were painted on the walls. After controversy, officials had expressed regret.